What are the different types of gold in jewelry? When you are buying gold jewelry, you often get to choose between different types of gold colors, gold karats, and gold plating options. What do all those things mean, and is there a big difference between the different gold types? Here’s a quick guide to learn about gold colors, karats, and coatings. Gold jewelry is not pure gold. It is an alloy; a mixture of metals. Gold jewelry can be alloyed with silver, copper, zinc, palladium, and nickel to create different gold colors. 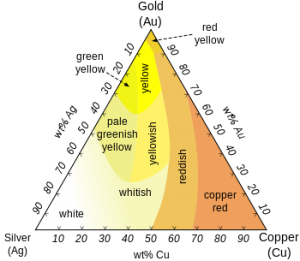 The most common gold colors are: yellow, white, rose, and green. Green gold (or Electrum) is mixed with gold, silver, and sometimes copper. Silver is what gives the gold alloy the green nuance. So which type of gold is the most popular? Yellow gold used to be the most favored choice, but when the gold price became more expensive, people turned to white gold instead. White gold has therefore been the more popular choice for the last 20-30 years, especially in engagement and wedding rings. The first thing to look for when buying gold jewelry, is the karat mark ”k”. The karat mark will let you know how much gold content the jewelry has. Then, look for the manufacturer’s trademark next to the karat mark. The manufacturer’s trademark is there to assure you that the karat mark is accurate. So, what does the karat mark mean? To know what type of gold coating the jewelry has, look for the quality stamp on the metal. Without a quality stamp on the item, you will not be able to know the type of gold used; if the jewelry is gold plated, rolled gold plated, gold filled etc. There are several types of gold plating options that you may come across when buying gold jewelry. Below is a short description on what the different types of gold plating options actually mean. Since there is no Federal standard for “gold layered”, a gold layered jewelry could in fact have a super thin gold layer! Gold leaf is gold that has been hammered by hand into extremely thin layers and been wrapped (or glided) around the metal. Usually 22K or 24K gold is used as thin gold layers/sheets to decorate art work and jewelry. You can recognize gold leaf jewelry by its irregularities of the foil surrounding the item. If the jewelry is “gold plated” or “gold electroplated” it means that it has a very thin layer of gold onto the surface of the metal. The base metal can be stainless steel or brass dipped into gold. Gold plating is a process known as electroplating that gives the jewel a gold-like appearance. To be named “gold plated” or “gold electroplated”, the gold layer needs to be at least 7 millionths of an inch thick and of at least 10k gold quality. Since the gold layer is quite thin, it can wear off over time. The metal must have a stamp indicating plated quality: “GP”, “G.P”, “GEP”, or “G.E.P”. Examples: “10K GP”, “10K GEP”. 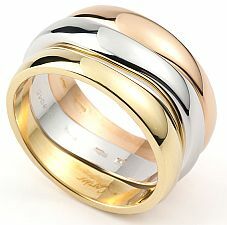 A “gold overlay” or “rolled gold plated” jewelry has a thicker gold coating and is thus more durable over time. The gold content must be of at lest 10K gold quality but can be lower than 1/20 of the total weight. The base metal can be brass, stainless steel, or copper. It uses heat and pressure process to mix and bond the metals. A gold overlay or rolled gold plated jewelry must have a stamp indicating plated quality: “GO”, “G.O”, “RGP” or “R.G.P”. Examples: “1/40 10K GO”, “1/40 10K RGP”.